San Andrés Colombia is one of the hotspots when visiting Colombia. 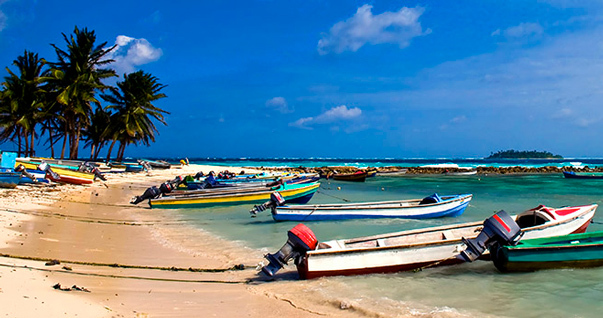 The island of San Andrés is located in the Caribbean Sea not far from Nicaragua. It is a small island of approximately ten square miles. Yet, what San Andrés Island lacks in size it makes up with its beautiful and pristine appearance. The island of San Andrés is officially part of Colombia but its old ties connect it with England. This makes the Island multicultural and bilingual the most common spoken languages are Spanish, English and Creole. Our websites offers information on accommodations such as all-inclusive hotels, budget hostels and other places to stay on the Island. Besides accommodation we offer more insights in the geography, weather and native culture of the island. Finally, we provide info on the best beaches, scuba diving and snorkeling spots on San Andrés Island. We hope you enjoy your stay on San Andrés and if you have any questions feel free to contact us. San Andrés is part of an archipelago that includes multiply cays, reefs, atolls and sand banks within an area of twenty square miles. There are two more inhabited island located in the archipelago named Providencia and Santa Catalina. Both these islands are tropical and rich in nature and culture. This makes the two small islands a popular tour destination for tourist on the main San Andrés island. If you are searching for a perfect combination of relaxing on white sand beaches, snorkeling between tropical fish and sniffing up some historical architecture and culture then San Andrés Colombia is the destination. The sea-horse shaped Island offers countless desert beaches and good weather year-round. There are roads running around the island that can you from place to place in no time with your scooter, car or the local bus. Don’t forget to visit the beautiful villages San Luis and La Loma on the way around the island, you will find peace & tranquillity there like you have never seen before. San Andrés is a famous destination for Colombia travellers but backpackers and western tourist are finding their way to this paradise island. You can find more information about the archipelago on our website SanAndres-Colombia.com. Enjoy your stay! Covered in coconut palms and cut by sharp ravines that turn into rivers after rain, the seahorse-shaped San Andrés is the largest island in the archipelago… San Andrés offers excellent scuba diving opportunities all around the island. When you’re planning a trip to San Andrés Island you should consider the seasons. Since the Island is located so close to the equator there are only two seasons a dry and wet one. When you are going for the beaches and sun it is probably better to avoid the wet season, not because it rains all day but it can be cloudy a couple of days in a row. The wet season brings green hills and fresh fruits. It also brings the largest migration of the land crab on the Island Providencia. The dry season is perfect for sunbathing and enjoying the beaches and waters. Don’t worry about the temperature that is fine year-round. If you are searching for a Caribbean paradise that is still relatively unspoiled by tourist we can definitely recommend you San Andrés Colombia. The island offers the same facilities as many of the more known Caribbean vacation islands like Aruba, Cayman Islands or The Bahamas. Yet, San Andrés is more pristine and tourism isn’t as overwhelming. With our travel advice about San Andrés you can easily navigate in this relatively unknown paradise and plan your journey from home before embarking on it. What do you want to know about San Andrés? One of our partners is Wayfaring.nl.